Yellow, the color of sunshine, is associated with positive feelings such as joy, happiness, cheerfulness, intellect and energy. Not surprisingly, a tone of yellow is usually included in Pantone’s top 10 women’s spring/summer colors. This year’s shade is called Custard, which is defined as “Sweet and sunny … a cheering tone that brings thoughts of pleasant relaxation and comfort food”. Yellow is one of those hues that doesn’t flatter every complexion, so it’s a great color for accessorizing with vintage costume jewelry. 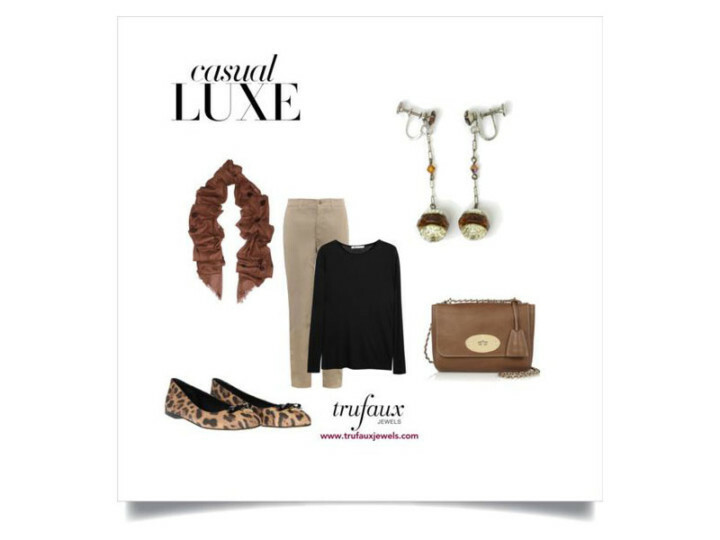 You’ll find a selection of classic, unique and versatile pieces in many shades of yellow on the TruFaux Jewels website. Let’s take a look at two of the gemstones (natural minerals) that come closest to today’s trendy yellow hue – citrine and yellow topaz – and their counterparts in vintage costume jewelry. Citrine is a variety of quartz whose color ranges from pale yellow to golden yellow and which rarely occurs in nature. The name is derived from the word citrus. 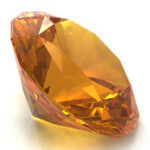 The color of this gem closely resembles the color of yellow topaz and yellow sapphire, which are both more expensive. Popular forms of citrine and topaz gemstones have been brilliant cut (where faceting is used to maximize a stone’s reflection of light, as in the example on the left), step cut (which shows colored stones to advantage), and pendeloque cut (a particular type of faceting of a pear-shaped stone). Both citrine and yellow topaz are the birthstones for November. 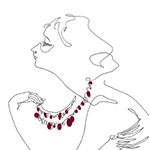 In the 1920s and 1930s, richly-colored glass stones and beads were commonly used in costume jewelry in styles that imitated their precious counterparts. Faceted round, rectangular or square yellow glass stones were often paired with imitation diamonds in necklaces, brooches, bracelets, clips, earrings and finger rings. Popular designs included stones channel-set in bangles as well as one-, two- and three-row flexible bracelets. This example (on the right) is a flexible (or line) bracelet by Wachenheimer Brothers, under their trademark Diamonbar. 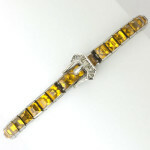 It has square citrine glass stones with a diamanté-encrusted buckle that is part of the clasp. Read more about this piece here. With the availability of new plastics such as Bakelite and Galalith in the early 20th century, jewelry designers in the Art Deco era were able to broaden their creative horizons with new forms that didn’t emulate precious jewelry. In addition, more colors than Mother Nature ever dreamed possible were available. The result was the production of whimsical, fun pieces. One example (on the left) is these 2 1/2-inch long dangling screw-back earrings in a color known as apple juice. They were made from plastic beads and hoops (possibly celluloid) connected with brass filigree findings. The length and movement add to their appeal. 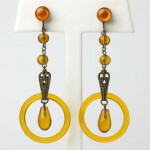 You can see detailed photos of these earrings here. Jewelry during the war years tended to be statement pieces, to compensate for shortages in fabrics and the absence of clothing ornamentation. The examples below are typical costume pieces from this period: large, stylized designs based on nature, bold polished curves, and embellishments with fashionable stones of the era. 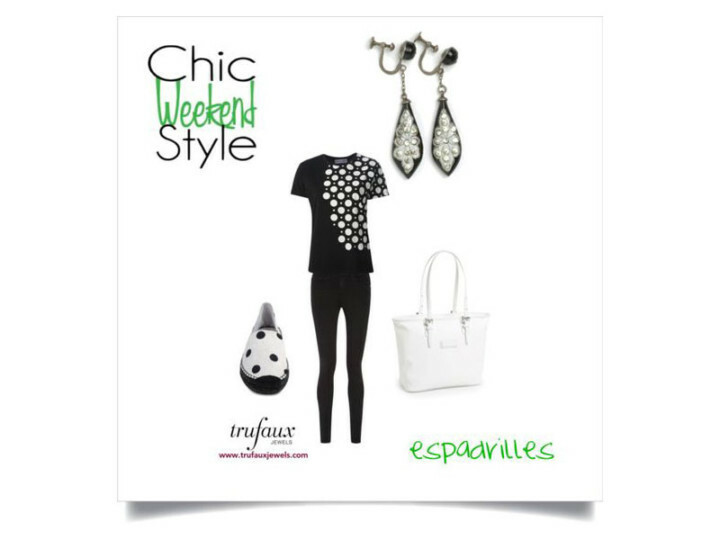 These characteristics are known as the Retro Modern style in jewelry. This 3 3/8-inch by 1 3/8-inch unsigned brooch (on the right) is a great example of the size and use of the stylized bow motif of the 1940s. This piece is made from sterling silver, which was used by costume jewelry makers from 1942-47, when the supply of base metals was limited to the war effort. Here the large, faceted square-cut yellow-orange glass stone is the focal point of the piece, with emerald-cut stones in pale yellow as accents. The larger photos of this brooch, which can be found here, show it in both the horizontal and vertical positions. 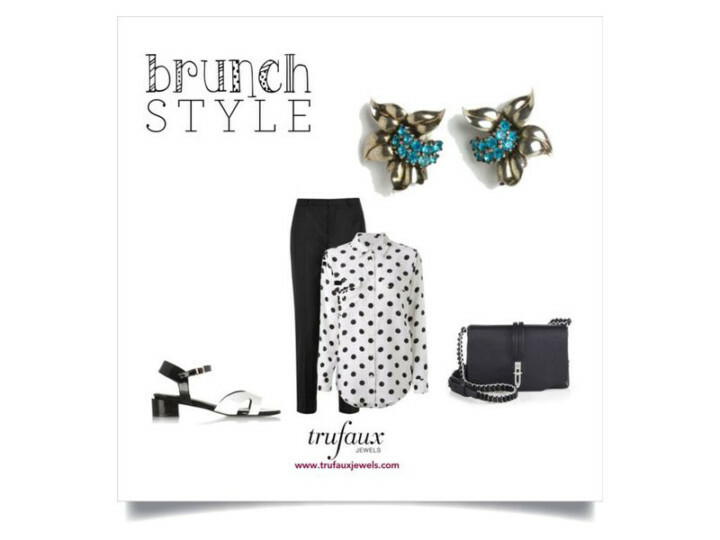 Take a look and then decide which way this piece should be worn! William Hobé was a maker in this period who used floral motifs extensively and superbly. His 1940s pieces were hand-made from sterling silver. 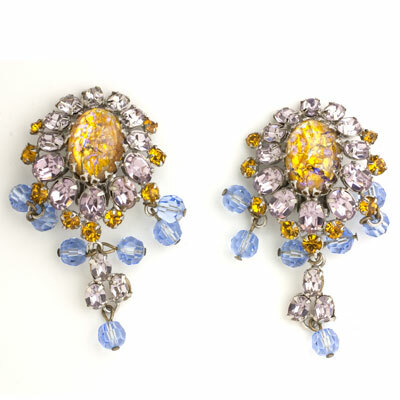 A particularly fine example of his work is this remarkable 4 1/8-inch by 2 1/2-inch bouquet brooch on the left (c. 1944). It has flowers in two shades of citrine/yellow topaz glass surrounded by leaves and buds and tied with a bow. 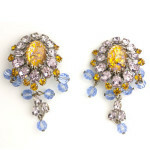 The matching earrings are shaped like flowers, with their furled petals around citrine/yellow topaz glass centers. You need to see the larger photos of this set here to appreciate its beauty and the three-dimensional quality of the brooch. By the 1950s, when rhinestone jewelry was in great demand, stone makers from Austria and Czechoslovakia developed new stone colors and what Julia Carroll (in Collecting Costume Jewelry 303) calls specialty glass stones (i.e., “glass stones with special colors, textures, or composition”). Costume jewelry designers from this decade used these stones to great effect. Here are two examples. This bracelet by Elsa Schiaparelli (on the right) features deep yellow art glass cabochons with faceted citrine/yellow topaz rhinestone accents, all mounted among antiqued gold-tone leaves. Larger, detailed photos of this bracelet, including close-ups of the cabochons, are here. Be sure to take a look so you can see the gold flecks in the spectacular art glass stones, so typical of the high-quality of this maker’s materials. Another 1950s maker who used stunning art glass as well as imaginative color combinations was Schreiner, as illustrated in these lavish dangling earrings on the left. Mixing bright yellow with pale lavender and blue may seem unusual to you. However, yellow is a great complementary color for purple because the two are opposites on the color wheel. Larger photos, including a close-up of the center art glass stone, and a complete description of these earrings are here. For more about color trends for women’s spring/summer fashion, read the Pantone Fashion Color Report Spring 2015 here. 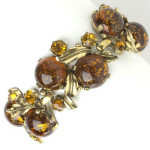 Take a look at my latest styling tips for wearing citrine/yellow topaz vintage costume jewelry. A pleasure to read, thank you for sharing! Great informative article, Barbara. It is true that shades of mellow yellow are difficult to wear successfully for many complexions, and a great alternative would be to enjoy this shade in accessories, as you mention. Thank you!